A multidisciplinary collaborative project was conducted to study the prevalence and distribution of soil-borne B. anthracis in Punjab Province, Pakistan and to ascertain its public health significance. Using a grid-based sampling strategy, soil samples (n=1985) were collected from villages (n = 397, 5 samples/village) and examined for Bacillus anthracis, using real time PCR assays. Soil samples were found positive for plasmid DNA of Bacillus anthracis (CapB) in 3 villages (n= 3/1985, 0.15%), whereas plasmid DNA of Bacillus anthracis (PA) was detected in soil samples of 4 villages, (n=4/1985, 0.20%). The odds of detecting plasmid DNA of B. anthracis (CapB) in Attock district were based on, distance from animal market which is not associated with presence of Cap B i.e. 1.217 (0.1087, 13.63), distance from main road 0.8373 (0.07478, 9.376), number of households in the village 0.902 (0.08044, 10.11). 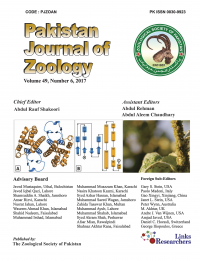 The odds of plasmid DNA of B. anthracis (PA) in Attock was not associated in distance from animal market 0.3043 (0.02718, 3.408), distance from the main road 0.8373 (0.07478, 9.376), distance from water source 0.5882 (0.05258, 6.581), number of household in village 0.2255 (0.02011, 2.528) in Chakwal only one sample was found positive, while in the Faisalabad, Sahiwal. In Gujranwala, D.G. Khan and Sargodha, no positive sample was detected. The odds of (PA) in Chakwal District pathogen B. anthracis PA plasmid positive sample shows no association with distance from Animal Market, distance from road, distance from drainage, not subjected to human population, and for distance animal density because only one sample was found positive others districts (Gujranwala, Sargodha, Sahiwal, Faisalabad and D.G Khan) showed no association.